All of us at the BlueRibbon Coalition, and many throughout the recreation community, were greatly saddened to learn of the passing last Thursday of a true recreational champion: Adena Cook (click here for our initial announcement). For those that wish to learn more about her life from her family and friends directly, or who just want to take a moment to reflect and remember, we are republishing her obituary below from the Post Register. ADENA S. COOK, 71, of Boise, passed away Thursday, April 5, 2012, at a local hospital with her family around her. Adena was born June 27, 1940, in Missoula, Mont., to Ward E and Louise P. Smith. Adena spent her early life in Missoula and Livingston, Mont. As a teenager, she moved with her family to Brainerd, Minn., where she graduated high school. She attended Hamline University in St. Paul, Minn., where she graduated with a bachelor’s degree in Political Science. It was there she met and married her husband, Jeff. The young couple moved to Hartford, Conn. They spent many weekends at the Cook family camp on Sebec Lake in Maine, using it as a base camp to hike the remote Maine mountain trails. In 1966, Jeff and Adena moved to St. Louis, where their family grew with the addition of their sons, Jeff Jr. and James. Building on an increasing interest in bluegrass music, she learned to play mandolin. She helped found the Missouri Area Bluegrass Committee to promote preservation of the music. MABC put on festivals and shows, and still continues to do so. In 1974, the family moved to Idaho Falls, where Adena provided love and comfort to her growing sons and Jeff. The family spent literally every spare minute camping and enjoying the Idaho outdoors, summer and winter. Adena was an avid hiker, fisherman and skier who involved her sons in the sports. Cook’s many careers included working as an efficiency expert, a full-time mother, community service volunteer and a computer store manager, before accepting the responsibilities as Public Land Director for the BlueRibbon Coalition in 1988. Adena was also an enthusiastic snowmobiler, riding thousands of miles each year in their favorite areas: Bone, Island Park, and Grey’s River in Wyoming. For many years, Adena and Jeff rode on vacations with S&W Adventure Riders in Colorado, Wyoming and Idaho. Best known in snowmobiling for her many years of work as the Public Lands Director for the BlueRibbon Coalition, a group dedicated to keeping public lands available for public use, Cook worked with land managers and BlueRibbon member organizations to maintain and expand opportunity for motorized recreation. Adena was a key champion in the battles to preserve recreational access, first in Idaho and then nationwide. 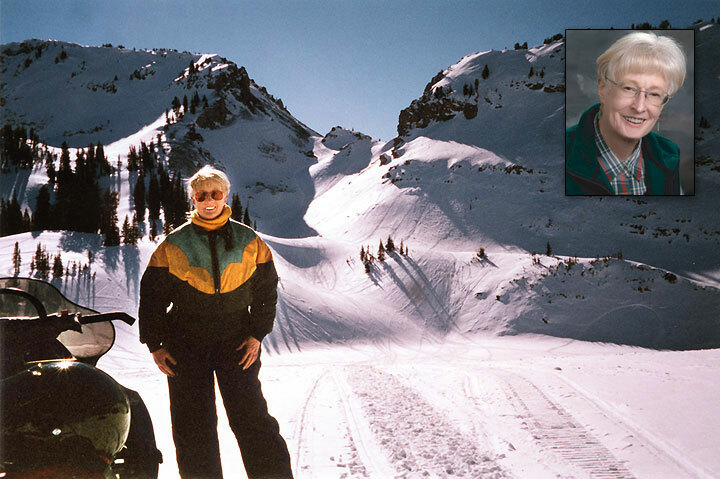 Adena was a tireless advocate for recreational access in Idaho in the ’70s and ’80s. When the BlueRibbon Coalition (BRC), a national recreation advocacy group, was formed in 1987, Adena volunteered as the first secretary of the organization. In 1989, she became the BRC’s first Public Lands Director, monitoring recreation access issues across the nation. Adena quickly earned respect from backcountry recreation groups around the country who sought her guidance on their local access problems. Secretary Mike Johanns selected her to the Roadless Area Conservation National Advisory Committee. The committee provided advice and recommendations on implementing the state petitions (Idaho’s and Colorado’s) for 2005 Inventoried Roadless Area Management Rule. She was also a guest columnist for the Idaho Falls Post Register, writing many articles about land use issues in Idaho. Due to Jeff’s declining health and to be closer to family, they moved from Idaho Falls to Boise in September 2010. She is preceded in death by her father, Ward E. Smith; mother, Louise P. Smith; and her husband, Jeffrey F. Cook Sr.
Adena is survived by her sister, Nikki Langworthy; her brother-in-law, Hal; and by sons Jeff Jr. (Sue) of Boise and James (Noa) of Orchard Park, N.Y.; and grandchildren, Veronica, Laura, Ben and Rebecca. A memorial service will be held at 2 p.m. Friday, April 13, at Hillview United Methodist Church, 8525 Ustick Road in Boise. Anyone wishing to make donations or memorials in her name should be directed to the Idaho State Snowmobile Assn. Scholarship Fund, 10400 Overland Road, PMB 384, Boise, Idaho 83709. To share memorials with the family, please visit Adena’s memorial web page online at www.cloverdalefuneralhome.com. The content above originally appeared in the Post Register. It is republished here with their permission.